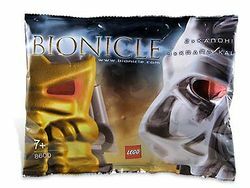 8600 Krana-Kal Bag is a BIONICLE set released in 2003. It is the second "Krana-Kal/Kanohi" pack, and contains three randomly selected Krana-Kal and two random Kanohi Nuva. The polybag contains five random masks, two of the Bohrok's Krana, and two of the Toa's Kanohi Nuva. It is the same set as 8599 Krana-Kal, but polybagged.